In the hybrid game, there’s the Toyota Prius … and everything else. Though many have tried, no other hybrid has ever come close to matching the King’s combination of economy, drivability, practicality, and price. That is, until now. 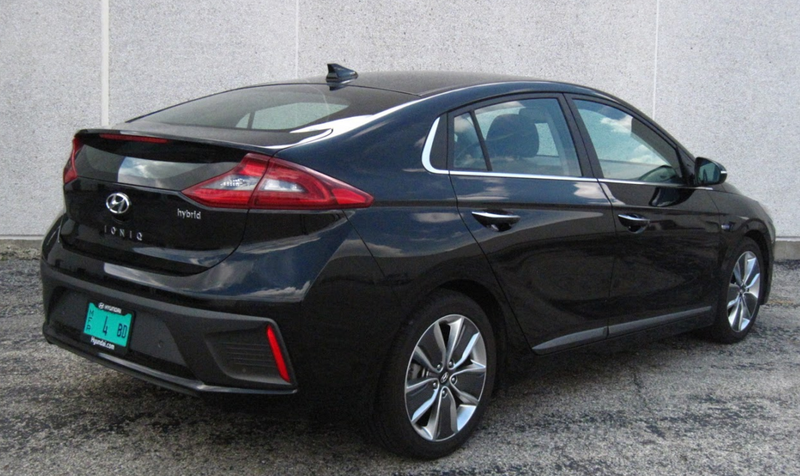 Compared to the benchmark Toyota Prius, the Ioniq Hybrid has rather subdued styling, but both share a rear window that is split horizontally by a rear spoiler–a layout that adversely affects rear visibility, in our opinion. Hyundai has been showing off its Ioniq compact hatchback at auto shows this year, promising (in order of introduction) all-electric, hybrid, and plug-in hybrid versions. We recently tested an electric version and found it to be a strong contender in the class. Now we’ve had a shot at the hybrid model, and our reaction is much the same. Where the Ioniq Hybrid immediately scores points is in value. Offered in Blue, SEL, and Limited trim levels, the base Blue’s $23,035 starting price (including destination) undercuts the least-expensive Prius by nearly $2500. And the Blue comes quite well equipped, including all the expected features plus Apple Carplay/Android Auto, a rearview camera, individual tire-pressure readouts, keyless access and starting, automatic headlights, dual-zone automatic climate control, adjustable driver-seat lumbar support, satellite radio, and 7-inch touchscreen. The $24,785 SEL adds blind-spot and rear-cross-traffic alert, heated front seats and mirrors, LED taillights, and a 10-way power driver seat. Optional is a $1000 Tech Package that brings forward collision warning and mitigation, lane-departure warning, and adaptive cruise control. 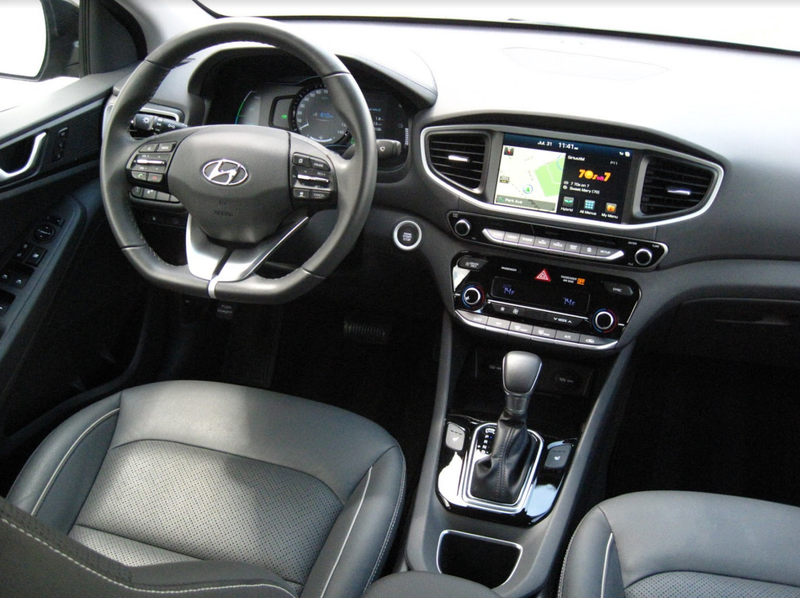 The tested top-line Limited adds leather upholstery, sunroof, auto-dimming inside mirror with compass and Homelink, HID headlights, and Hyundai’s BlueLink telematics system. A $3000 Ultimate Package (which was included on our tester) adds in forward collision warning and mitigation, lane-departure warning, adaptive cruise control, adaptive headlights, rear obstacle detection, navigation system with 8-inch touchscreen, wireless cell-phone charging, and an Infinity Premium Audio system. 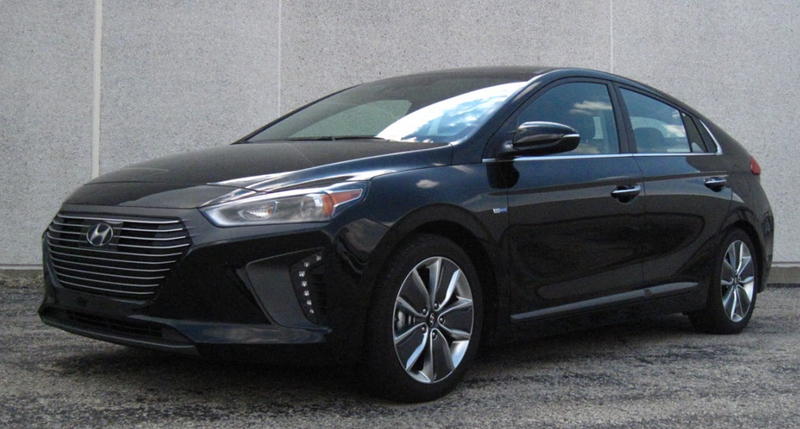 Ioniq also comes with a more powerful engine/electric-motor combination and boasts even better EPA fuel-economy estimates than a non-Eco-model Prius. The Ioniq Hybrid’s interior is also less gimmicky than the Prius’s, with more-conventional controls and a traditional shift lever. Supporting one of those points was our 0-60-mph time of 9.78 seconds. While hardly quick for a regular compact car, it’s a hair better than the 10.0 seconds we recorded in a Prius Prime Plug-in, which Toyota says is a little faster than a regular Prius hybrid. Credit the Ioniq’s 139 combined gas/electric horsepower rating, which handily tops the Prius’s 121. Furthermore, whereas the Prius uses a CVT automatic transmission that some deride for the way it allows engine speed to remain at a constant high level (read “noisy”) under hard acceleration, the Ioniq uses a 6-speed automated manual that provides a more traditional driving experience. However, some of our testers thought the Ioniq Hybrid’s gas/electric powertrain wasn’t as refined overall as the Prius; they complained of a occasionally clunky, non-linear feel, both when accelerating and when braking to a stop (like most hybrids, the Ioniq Hybrid uses a regenerative braking system). We averaged 48.9 mpg in 618 miles of about 1/3 city driving. While certainly impressive, that doesn’t match what we’ve gotten in similar summertime tests of a Prius Eco (mileage tends to drop off a bit in cold weather), and is a fair amount lower than the Ioniq Hybrid’s 55-mpg EPA combined estimate. Furthermore, our testers who drove it mostly in the city — where a hybrid traditionally does a little better than on the highway — barely topped 45 mpg. Then there’s practicality. Both the Prius and Ioniq offer decent room for four adults and hatchback versatility that provides a good amount of cargo space. Average-size folks will find adequate headroom and legroom front and rear in the Ioniq, though tall drivers might yearn for more legroom, and anyone behind them might do the same. Also, the rear seat cushion is low enough to hinder ease of exit, which gets even more awkward if the front seat is pushed far back. Prius is a bit better when it comes to overall passenger accommodations, but not by a lot. On vehicles without our test car’s premium audio system, the right-side indent at the rear of the cargo area may be matched by one on the left, which would provide more width. The rear seat backs fold down, but they rest about three inches above the level of the cargo floor, making it more cumbersome to slide long items forward. 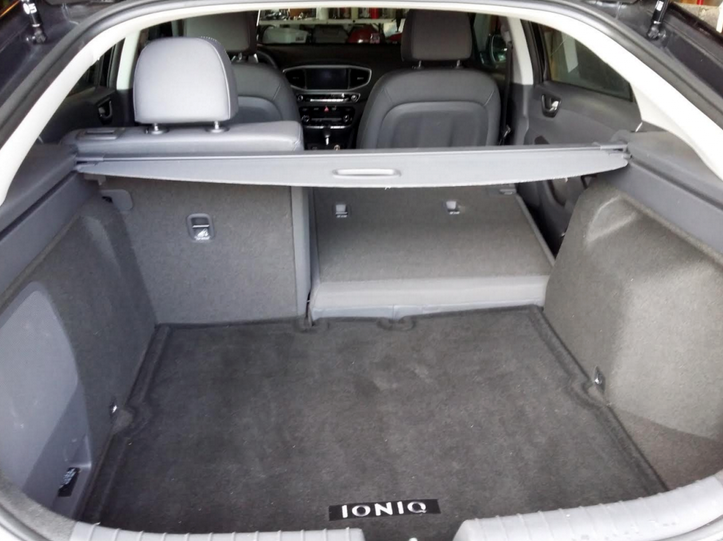 At least in our test car, the rear of the cargo area was only “indented” on the right side, limiting the width of what could be carried in back; however, that may have been due to a speaker of the optional Infiniti Premium Audio system taking up the left-side indent. The rear seat backs fold down for more space, but they rest about three inches above the level of the cargo floor, making it difficult to push long items forward. Prius’s cargo area is similar. Cabin storage is quite good in both, with the Prius’s main advantage being a more usable console box. Thus, in terms of overall passenger and cargo space, the Prius holds a very slight edge. When it comes to visibility, both the Prius and Ioniq are fine to the front and sides, but have a horizontal bar the splits the rear window — and thus the view — into upper and lower halves, which can annoy a bit. They also both have large rear-corner blind spots, though the Prius’s isn’t as bad, and its rearview camera offers a wide-angle, 180-degree view vs. about 160 degrees for the Ioniq. Each car’s audio- and climate-control layouts suffer some gaffes but are easy enough to use. In the Ioniq, a long reach to the dashboard touchscreen is the biggest demerit, but it’s countered by a number of easier-to-reach buttons and knobs along with some redundant controls on the steering wheel. Any car that so clearly dominates its segment as the Prius has long done essentially wears a target on its back. And while legacy alone will likely keep it at the head of its class — at least in terms of sales — Hyundai’s Ioniq is the first rival that has aimed for center and so nearly hit its mark. Two cars. Same manufacturer, same product line, same trim level, different powerplants. Very different reactions. Consumer Guide®’s rapid-fire tests of two Hyundai Ioniqs was a quick immersion in the South Korean automaker’s new line of electrified vehicles. The initially market-limited Ioniq Electric was a pleasant surprise to this reviewer, mostly because it had the looks and accommodations of a mainstream compact sedan (not all pure electrics do) with just enough range to make a driver begin to let go of the dreaded “range anxiety.” Fitting in with its automotive surroundings and making a battery-powered car seem a little less odd is the Ioniq Electric’s signature trick. Then came the Ioniq Hybrid, and the magic seemed to disappear like a dove placed in a top hat. Like the Electric, CG’s test Hybrid had top-level Limited trim (there are slight equipment differences between the Electric and Hybrid), so convenience and ambience were the same, more or less. But actually driving the Hybrid felt like, well, driving a hybrid. This has been done before, by a number of cars, and the Ioniq didn’t really do anything to raise the bar. In fact, in this driver’s test stint, the Hybrid didn’t even quite come up to the bar. After a drive of 177.4 miles with 40 percent city-type driving, he averaged 45.52 mpg—a good nine or so mpg less than the EPA projections. Topping 50 is the new gold standard for hybrids, and it can be done. See the Toyota Prius. An easy-to-understand control layout is a positive point for the Ioniq. Plus, it tops the hybrid-king Prius in power. But then hybrid buyers aren’t necessarily in it for the horsepower. Optioned up to $31,460 delivered, the test Ioniq Limited cost about the same as a Prius Four Touring but it didn’t make it any better. Written by: The Daily Drive staff on August 18, 2017.on August 23, 2017.